Brussels French- and Dutch-speaking universities ULB and VUB are launching konekt.brussels today, a new concept that sees a number of activities and infrastructural changes carried out in order to boost the capital’s reputation as a student city. Organisers also hope to better connect students with daily life in the capital. Konekt.brussels will see lessons taking place in venues outside of university buildings, such as in cultural centres, EU institutions, hospitals and prisons. Students across disciplines will take to the capital’s institutions to follow regular classes in a related atmosphere. Professionals working in the institutions will also take part in the lessons. 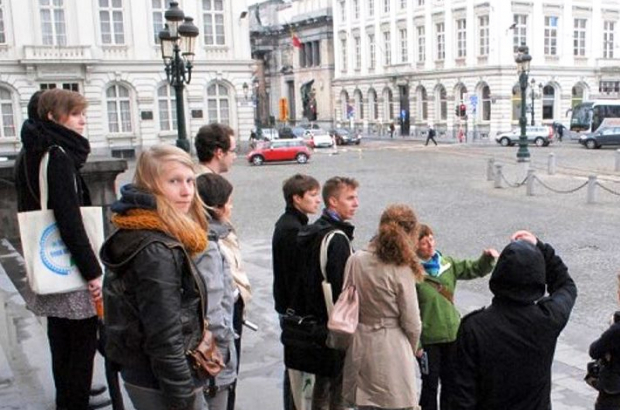 “Konekt.brussels encourages students to discover the city and its society,” says VUB rector Caroline Pauwels, who emphasises that the initiative is being spearheaded not only to attract and educate international students but also students from across Belgium. The concept’s central initiative is extended with Brussels City Campus, in co-operation with Bozar, in which public spaces become lecture halls and centres for debates and symposiums. Aside from Bozar, these events will bring students and the public together – literally and figuratively – in Muntpunt, Beursschouwburg, Belfius bank branches, public transport stations and other venues. Another focus of konekt.brussels is helping students understand the relationship between their discipline – be it arts or the sciences – and society. The universities will work with outside organisations to tie lessons in with an urban area’s social realities. Finally, next spring is Pop-Up University Week, where all of this will culminate in all classes taking place off-campus.